With the recent launch of the iPhone 6s Plus and the unveiling of Google’s new Nexus 6P smartphone, it’s getting harder to decide between an Apple iPhone and an Android phone. If you’re looking to buy a big-screen phablet phone but you’re stuck on the fence, then our iPhone 6s vs Nexus 6P comparison review will help you find the best phablet for your needs. If you’re trying to choose between Apple’s iPhone 6s Plus and a big-screen Android phone, Google’s Nexus 6P is likely to be one of the options you’re considering. Both the 6s Plus and 6P are big devices – classic phablets – with large screens made for large hands. They are, in many ways, the two main rivals for big-screen smartphone buyers. 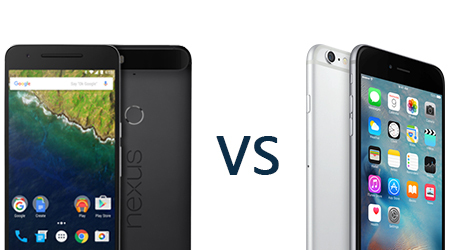 “ This review is a comparison test between the iPhone 6s Plus and Nexus 6P. We’ll look at the technical specs, price and software on both devices, and help you decide which is the best big-screen smartphone for your needs. “ – Editor Notes. One of the other appealing things about the Nexus line is the relative low cost compared to many other devices on the market – true, the price of these devices has climbed as their hardware components have becomre more powerful, but still, for the money you do get a lot of bang for your buck. Front camera: 5 MP photos and 720p HD video. Rear camera: 12 MP photos. ƒ/2.2 aperture. 4K video. Front camera: 8MP camera; 720p HD video. Rear camera: 12.3 MP; f/2.0 aperture, 4K video. Battery: 3450 mAh. Up to 7-9 hours battery life mixed usage. By comparison, the iPhone 6S Plus does look a little less current. This is a tock year in Apple’s tick/tock design cycle, so while the 6S has a number of improvements over its predecessor, it looks identical. The aluminum is a little less slippery than before and suffers less from the infamous bending that we saw in its predecessor, but it’s a familiar and possibly overfamiliar design now. The Nexus display is really great: it’s a 5.7-inch AMOLED delivering QHD resolution of 2,560 x 1,440 pixels at 518 ppi. As we’ve come to expect from AMOLED, the blacks are very black and the colors very vivid. The iPhone 6S Plus display is slightly smaller at 5.5 inches, and while Apple is rumored to be considering AMOLED – the Apple Watch uses it – the iPhone sticks with the familiar IPS LCD. The screen is sharp but less dense than the Nexus, and, with 1,920 x 1,080 pixels, it’s lower resolution too. It’s still a retina display that delivers crystal clear text and images, but the display in the Nexus is better. The Nexus 6 has an octa-core Snapdragon 810 with four low-energy cores and four high-performance ones, topping out at 2 GHz and backed with 3 GB of RAM. Internal storage is 32, 64 or 128 GB and there’s no option to add more with microSD cards, which aren’t supported. The Nexus has a 12.3 MP main camera and an 8 MP front-facing one, and while it’s an excellent camera with a really good sensor, it lacks Optical Image Stabilization, which we’ve come to expect from devices this big. The Apple device has it, as well as a new 12 MP sensor with larger pixels for better low-light performance. If like us you have shaky hands, the iPhone will take the better photos – especially in low light, where the slightest shake can ruin your shot. As you’d expect from a Nexus, the new Nexus 6P runs the latest and greatest Android in the form of Marshmallow, aka Android 6.0. It’s stock Android, which means no manufacturer-specific apps or customization. The Nexus 6P is one of the reference devices for Android 6.0 Marshmallow. This guarantees the Nexus 6P several great software features, including Doze Mode and App Standby for better battery life, granular app permission control, native fingerprint reader support, Google Now on Tap, monthly security updates, and more control over the Android system than ever before. For more of what the latest version of Android delivers, take a look at our Android 6.0 Marshmallow review. The iPhone 6S Plus runs Apple’s own iOS 9, and supports a new feature: 3D touch, aka Force Touch. This adds an extra layer of interaction to screen taps, so, for example, a hard press on the Messages app brings up a shortcut menu for common tasks such as creating a new message; a hard press in a third party Twitter app shows the conversation and so on. It seems gimmicky at first but you soon miss it when you use other devices. The Huawei Nexus 6P has a whopping 3,450 mAh battery – the largest ever in a Nexus. This means that the Nexus 6P has more than enough juice to power a large QHD screen, and, combined with Doze Mode and the stock battery saver and app standby features, the Nexus 6P gets you through a full day of easier than any other Nexus. You certainly won’t need to cripple your Nexus just to make it through to dinner time. The iPhone 6S Plus battery is smaller than before: at 2,750 mAh it’s five percent smaller than the one in the 6 Plus. Apple has tweaked its hardware and software so that missing 5 percent doesn’t adversely impact battery life, but it’s still notably smaller than the Nexus, which we’d expect to last longer in real-world scenarios. It’s the biggest battery in any iPhone, but it’s small by Android standards. In almost every respect, the Nexus is a better buy than the iPhone. It has a bigger, better display. It has more memory and a bigger battery. It looks fresher. It has fast charging. It lacks the optical image stabilization of the iPhone and you could argue that iOS is prettier than Android, but that last one’s a judgment call. And the most important spec of all is the price. Apple doesn’t do a 32 GB iPhone 6S Plus, but if it did it’d cost a lot more than the equivalent Nexus 6P: a 16 GB 6S Plus is US$749, which is US$250 more than the 32 GB Nexus. For 128 GB you’re looking at US$649 for the Nexus and a whopping US$949 for the Apple one. The iPhone good, but not US$300 moreso. What do you think? Is the Nexus the clear leader now, or does Apple still have the edge? Let us know below. Sometimes you will have playback issues about Nexus 6P vs. iPhone 6s Plus, etc, because these smartphones don’t support all video formats, so you should encode these unsupported videos to they playable videos. Below is a simple guide on how to play various HD videos and DVD/Blu-ray movies on both phones. Pavtube Video Converter Ultimate provides the best all-in-one solution to convert any video to over 180 video formats and 14 popular audio formats including M4V, MP4, AVI, MOV, WMV, MKV, FLV, etc. Built in 350+ Preset profiles for any Apple and Android Devices, this video converter also can convert videos to the latest devices like Nexus 6P, Galaxy Note 5, iPhone 6S/6s Plus/iPhone 6/6 Plus, iPad Air 2, iPad Mini 4, iPad Pro, Apple TV 4 etc for playing on the latest mobiles & tablets. 6X faster and no quality loss. If you are a Mac user, you can get iMedia Converter for Mac.